Digital Transformation, Digital Disruption, and Digital-first; these are some of the business buzzwords that we have been hearing frequently for a decade or two. 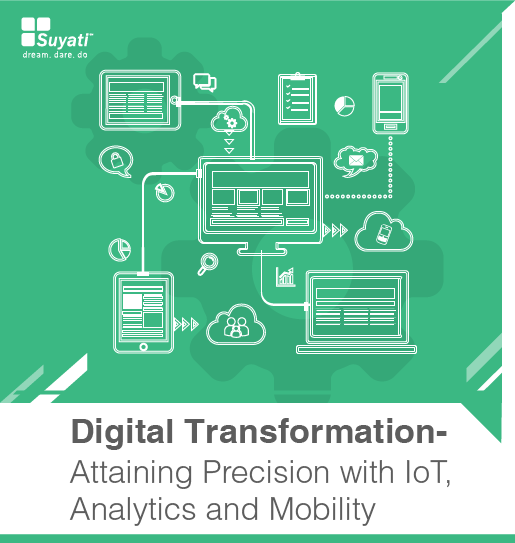 Being a digital transformation enabler for enterprises belonging to multiple domains, Suyati focuses on leveraging the niche and disruptive technologies of today- Social, Mobile, Analytics, Cloud and the Internet of Things (IoT). These novel technologies are already in action forcing companies to revisit their digital transformation strategies. This white paper presents the key elements of the Digital Transformation Mix and also looks at how enterprises can attain precision in digital transformation with the power of IoT, Analytics and Mobility.